A lucrative revenue stream is opening up as glamping grows in popularity. This luxury accommodation requires high quality heating which will enable progressive installers to benefit from a potential work bonanza, as Ian Sams at Specflue explains. Glamping – or glamorous camping – is a booming and potentially highly profitable market for heating installers bold enough to invest time and money in this relatively new type of holiday experience. Glamping, which focuses on comfort and luxury, employs a wide variety of accommodation types including bell tents, cabins, yurts, shepherds’ huts and pods. However, these different forms share two qualities – they are located outdoors and material comforts (from a real bed and an electrical supply to hot and cold running water) come as standard. Of course, they also require heating and this is where opportunities lie for installers. And these opportunities are growing. In 2016, the outdoor hospitality industry saw an increase of 1%, according to IBIS Worldwide. Although this doesn’t sound much, it equates to more than £2 billion revenue. 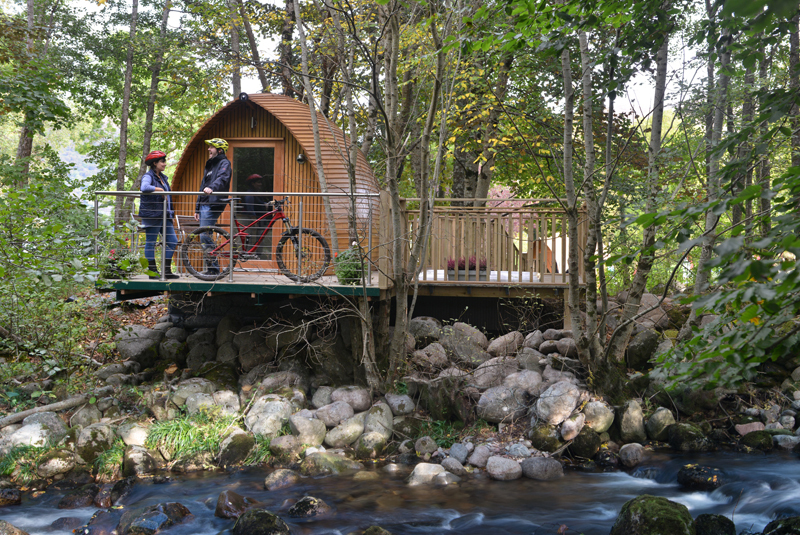 And research organisation Mintel has estimated that the total number of camping/glamping trips is expected to rise to more than 21 million in 2020 – with Britain’s camping and caravanning market worth £3.2 billion by then. There are many different options when it comes to heating sources for a glamping holiday, but one of the most natural ways (and therefore, perhaps, most in keeping with the notion of the ‘getting back to nature’ ambiance that glamping implies) is a wood burning stove. Wood logs are a renewable fuel provided they are bought from a reputable supplier who sources from well managed woodland. And burning wood is pretty much carbon neutral (the carbon dioxide given off during combustion is similar to that absorbed by the tree providing that wood during its growth). Furthermore, wood burners are exceptionally reliable – even if there’s a power cut, a solid fuel appliance can offer a constant source of heat at any time. If the glamping structure is to be moved frequently, ensure that the stove is compact and lightweight so that it can be transported easily. But fix the stove securely to avoid movement. Confirm that the stove is not oversized in terms of output. If the area needs, say, 6kW of heat it is better to work a smaller stove hard than let a 10kW stove tick over. The appliance must be sited on a hearth, which needs to extend at least 230mm in front of the stove. All stoves – including those used for glamping – need a flue to discharge the smoke caused by wood burning. The stove itself and the flue pipe will be hot and could ignite the fabric material of the tent. If the stove is to be placed in a fabric structure, think about positioning and safety in terms of distances to combustible materials. Stove and flue manufacturers issue guidance on distances to combustible materials, which must be adhered to. Position the stove away from exits. Any appliance rated at 5kW or above must have ventilation into the room, which can’t be shut off or blocked. Combustible materials other than the tent structure itself must also be considered, such as front distances to a sofa, and so on. Curtains and drapes must be prevented from blowing into this ‘keep clear’ zone. The stove itself needs to be placed on a flat, hard surface such as a large tile or piece of slate to keep it steady. We also recommend the use of flame retardant matting as a secondary measure to protect the groundsheet from stray embers. Remove all labels from the stove and flue kit components before use. Fire is not the only safety risk with wood burning stoves. Carbon monoxide poisoning is also an ever-present danger where there is combustion. You can’t rely on a carbon monoxide detector to keep the occupants safe in a tent; they may be useful at home, in a caravan, in a log cabin or in a motorhome, but they are not designed for tent conditions. Ideally, tents should be designed to let the air flow through the tent so you have a supply of fresh air. We still recommend that an alarm is fitted/ used. Flue pipes must have the same diameter or equivalent cross sectional area as the flue outlet on the appliance and should not be smaller than the size recommended by the appliance manufacturer. As a general rule, around 1kW of heat is needed for each 14 cubic metres of space in the room. Modern stoves are particularly efficient with at least three quarters of the generated heat entering the room (the rest is expelled through the flue).